From previous posts (specially from Command Line Functions for Text Mining in WEKA), you may know that writing command-line calls to WEKA can be far from trivial, mostly because you may need to nest FilteredClassifier , MultiFilter , StringToWordVector , AttributeSelection and a classifier into a single command with plenty of options -- and nested strings with escaped characters. Apply StringToWordVector with specific options: lowercased tokens, specific string delimiters, etc. Get only those words with Information Gain over zero, which implies using the filter AttributeSelection with InfoGainAttributeEval and Ranker with threhold 0.0. Make use of 10-fold cross validation, which implies using FilteredClassifier; and as long as I have two filters (StringToWordVector and AttributeSelection), I need to make use of MultiFilter as well. Choosing FilteredClassifier, and J48 as the classifier. 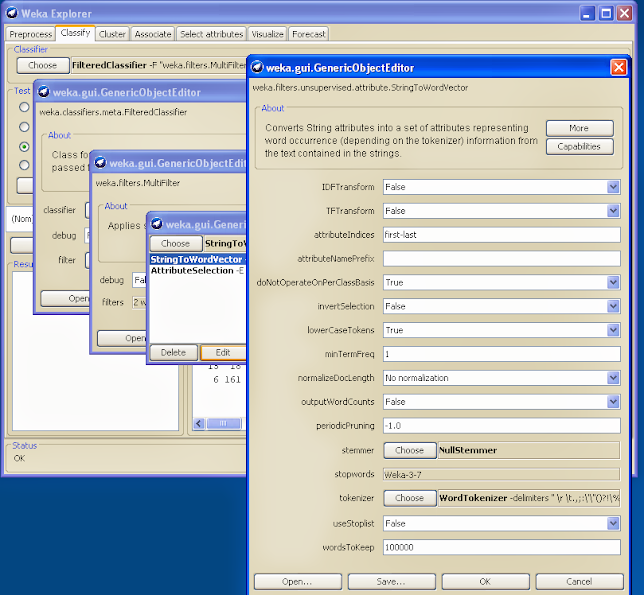 Choosing MultiFilter as the filter, then deleting the default AllFilter and adding StringToWordVector and AttributeSelection filters to it. Editing the StringToWordVector filter to specify lowercased tokens, do not operate per class, and my list of delimietrs. 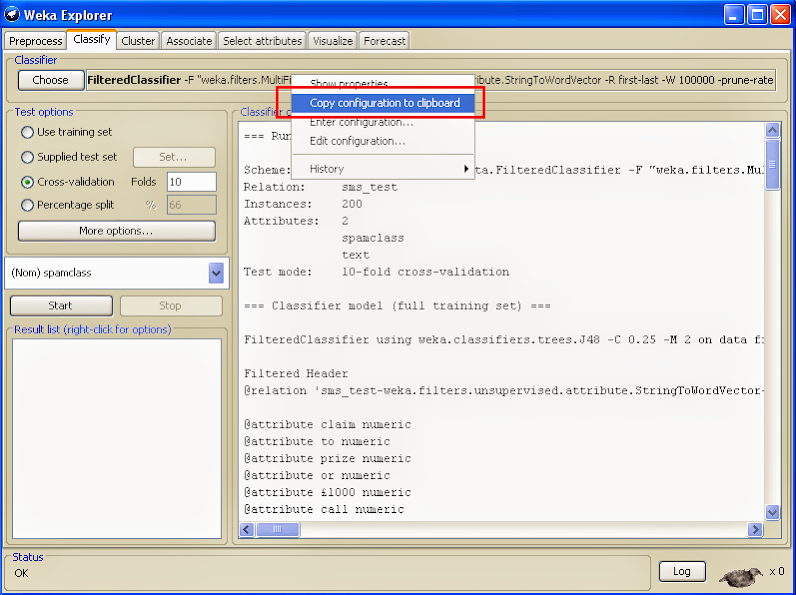 Editing the AttributeSelection filter to choose InfoGainAttributeEval as the evaluator, and Ranker with threshold 0.0 as the search method. Output word counts rather than boolean word presence. Specify list of string attributes to convert to words (as weka Range). -S \\\"weka.attributeSelection.Ranker -T 0.0 \\\"\""
So now you can change other parameters if you want, in order to test other text representations, classifiers, etc., without dealing with escaping the options, delimiters, etc.